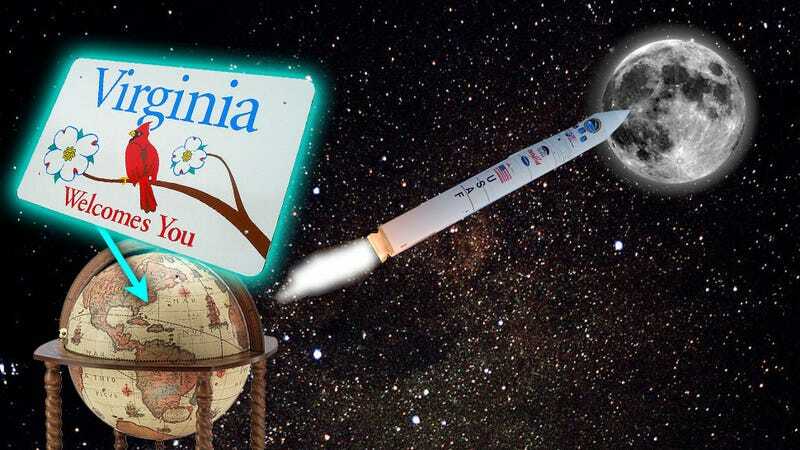 It's not going to be carrying people or the first Waffle House to be placed on lunar soil, but the next rocket to be sent into lunar orbit will be launched from Wallops Island, Virginia next month. This will be the first time the Wallops Island launch facility will send anything beyond Earth's orbit. It's also the first use of a Minotaur V rocket, a repurposed Peacekeeper missile. The Minotaur V is a five-stage solid-fuel rocket operated by Orbital Sciences. The payload is a car-sized lunar orbiter called LADEE (Lunar Atmosphere and Dust Environment Explorer) tasked with studying the very thin and tenuous lunar atmosphere. It's unlikely the Wallops Island facility will ever be used for future manned lunar flights in Orion spacecraft, but I don't want to discourage any tiny, very resilient stowaways from realizing their dreams. Along with studying what little atmosphere the moon has, the probe will spend its 100-day mission looking for evidence that the moon kicks up dust from the surface. So, studying floating dust and a barely-detectable atmosphere. It's amazing how being at the moon can make even that seem exciting.